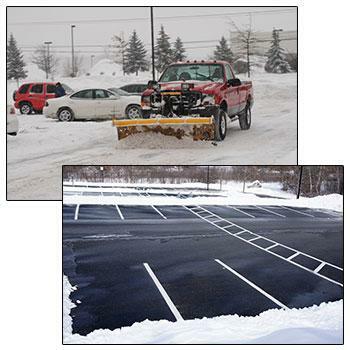 Our snow plowing division can handle anything from business parking lots to working for local municipalities on city roads. We also offer full salting services. Whatever Mother Nature has to throw at us our staff will be there to handle it. Our snow plowing division has been working with local municipalities to keep city roads clean, as well as providing our services to commercial parking lots and HOA. We have you covered for all your commercial snow plowing and snow removal needs. Serving Lebanon and the surrounding areas, Gassert Roofing offers around the clock service. Well keep your business parking lots clean and safe for your employees and customers. Need around the clock snowplowing? At Gassert Roofing we use a proactive approach to the winter season: well work with you to design a comprehensive strategy tailor made for your site. Well walk the grounds and map out the best plan of attack; taking note of traffic patterns and give special attention to hydrants, curbs and other things hidden under snow. When outside gets ugly, were ready to go 24/7 were watching the weather so you dont have to. Our trucks are moving all day and all night. Gassert Roofing plans accordingly to whatever Mother Nature has in store. Some days its sleet, others its a snowstorm, but weve got you covered. If a warm up happens after a major storm, well make sure to keep your site clean and slush free so ice doesnt form when the temperature drops again.